I’ve been working with Autumn Blaze for about two weeks now. Dawn and I recently brought her to the rescue’s main property. 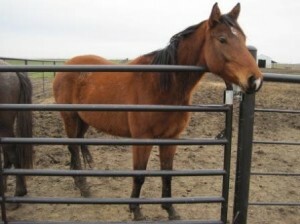 She’s a big stocky mare, 1/4 thoroughbred and 3/4 Quarter horse/paint and will be four this spring. She’s had no training up to this point. Autumn has been fun to work with–she’s laid back and pretty curious. When we went to get her she walked right up into the trailer on her own when we weren’t even watching. I’ve worked with her now about half a dozen days and she’s coming along really nicely. The first weekend we spent a lot of time getting to know each other. She was still a little hesitant about people and about being touched, but figured out pretty quickly that it felt really good to get her ears and cheeks scratched! I had to teach her how to eat treats, as she had no idea how to eat food from my hand. Then, we promptly did some lessons on polite manners and space. This included a lot of Alexandra Kurland’s The Grown Ups are Talking game, as well as some targeting and a basic introduction to head lowering. At this point, she was pretty calm and relaxed around me and was picking up on new things fairly fast. Time to introduce a halter and lead. Since she was comfortable being touched on her face and neck, it didn’t take but a couple of treats to convince her that wearing a halter was fun. 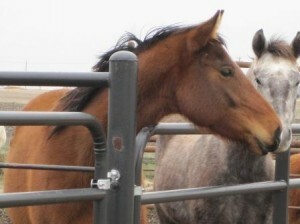 We also worked several times on leading and giving to the pressure of the lead rope in the pasture. 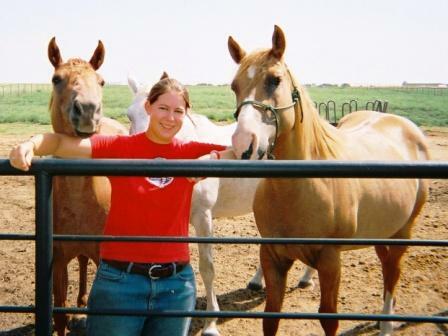 I like to start working on leading in the pasture–the horses are general more comfortable there. Today was our first day out in the open and she did great! She snorted a few times when we left the pasture, but figured out pretty quick that outside the pasture was where all the fresh green grass is! We wandered around for half an hour or so and by the end she was calm and relaxed. We also worked some more on backing, as well as walking on strange surfaces, including the concrete drive and a large piece of plywood. Watch the short clip below to see her walking back and forth over a piece of wood.